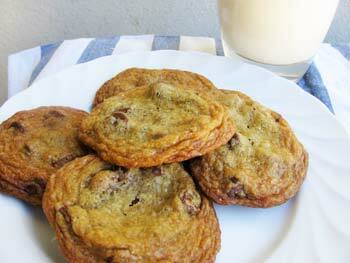 This recipe is for those of you who prefer your chocolate chip cookies chewy, not crisp. These are super easy Chocolate Chip Cookies to make, thanks to the use of melted butter in the cookie dough. Have you ever been frustrated waiting for your butter to soften before you could begin mixing your favorite chocolate chip cookie dough? Then I discovered this great Chewy Chocolate Chip Cookies recipe that calls for melted butter, in the great cookbook, Mom's Big Book of Baking , from mom and pastry chef, Lauren Chattman. Although the ingredients in both chocolate chip cookie recipes are identical, using melted butter instead of softened and adjusting the ratio of brown sugar to white results in a delightfully chewy chocolate chip cookie! The instructions guide you to use parchment paper and/or silicone liners on your cookie sheets. Alternatively you can use ungreased baking sheets. Preheat oven to 375F degrees. Line baking sheets with parchment or silicone liners. In a medium bowl combine the four, baking soda and salt and set aside. In a large bowl, stir the cooled melted butter and sugars with a wooden spoon until creamy. Add the eggs and vanilla beating until smooth. Stir in the chocolate morsels and nuts (if using). Place the cookie dough in the refrigerator for 10 minutes (or up to 6 hours) to let the dough firm up. Drop by heaping tablespoons onto lined cookie sheets, leaving about 3 inches between cookies. Bake for about 8 to 10 minutes or until golden around the edges but still soft on top. Cool on baking sheets 5 minutes then transfer cookies to wire racks to cool completely or enjoy warm. This recipe yields about 36 large Chocolate Chip Cookies. Balls of the chocolate chip cookie dough may be placed next to each other on parchment lined baking sheets, frozen, transferred to plastic freezer bags, and stored in the freezer for up to 1 month. Frozen cookies may be placed in the oven directly from the freezer and baked as directed. They may take 1-2 minutes longer to finish baking. 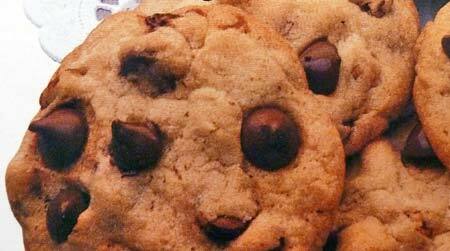 Recipe source: This great chewy chocolate chip cookies recipe is adapted from Mom's Big Book of Baking by Lauren Chattman. The perfect recipe for soft and chewy cookie jar cookies. Perfect anytime! In a medium bowl, whisk together the four and baking soda and set aside. In a large bowl, beat the butter and sugars with an electric mixer on medium speed until pale and fluffy, about 2 minutes. Reduce mixer to low and add salt, vanilla and eggs and mix until well blended, about 1 minute. Mix in the flour mixture just until incorporated. Drop dough by heaping tablespoons onto lined cookie sheets, leaving about 2 inches between cookies. Bake for about 10 to 12 minutes or until golden around the edges but still soft in center, rotating the sheet 180 degrees halfway through baking time. Cookies can be stored in airtight container between layers of parchment. This recipe yields about 3 dozen Soft and Chewy Chocolate Chip Cookies.